Hello Everyone !!! 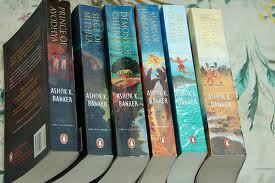 Welcome to my very first book review – Ramayana series by Ashok K Banker. I picked the first book “Prince Of Ayodhya” at a local library. It was so awesome that i just couldn’t stop reading. Ashok K Banker explains how the story of Ramayana is being told from generations, person to person and also how everyone has written from their own perspective.Valmiki’s Ramayana is quite different from Tulsidas Ramayana. He stresses on how the story lines got changed over time based on the views of the society but the underlying values remain the same. Banker has written the series with a unique sense of imagination and detail. DON’T be surprised if you get goosebumps while your reading. This book is for all. For believers of Rama, Non Believers, those who have read other versions of Ramayana and those who have never read Ramayana. Any person irrespective of his faith can read the book. One can even pick this book like any other fiction and enjoy it. Nice collection ! Are these books available on Amazon India?